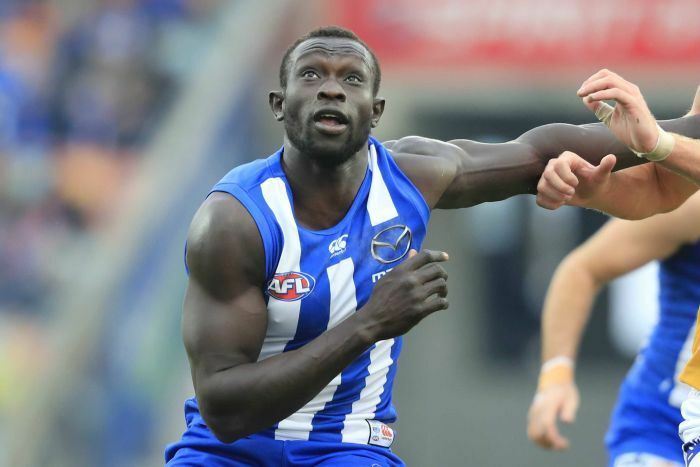 Majak Daw says he has been blessed with a second chance at life and has vowed to return to the footy field in an emotional open letter issued by the North Melbourne Football Club this afternoon. Daw, 27, was hospitalised after an incident near Melbourne’s Bolte Bridge the week before Christmas. He was pulled from the Yarra River and sustained serious injuries to his hips and pelvis. At the time, Victoria Police confirmed a man was found with non-life-threatening injuries in the Yarra. “The circumstances surrounding my incident have been extremely challenging for my family, friends and anyone that knows me for that matter,” the letter read. “I just want to thank everyone for their love and support over the past month. Daw moved with his family to Australia in 2003 and 10 years later became the first Sudanese-born player to play in the AFL when he made his debut with the Kangaroos. He played 50 games with the Kangaroos and kicked 40 goals. The 27-year-old enjoyed a breakout season in 2018, playing 18 matches primarily as a defender. He said that after the incident, his attitude and outlook had improved. “I hope to be back out there playing in the blue and white stripes soon,” he said.